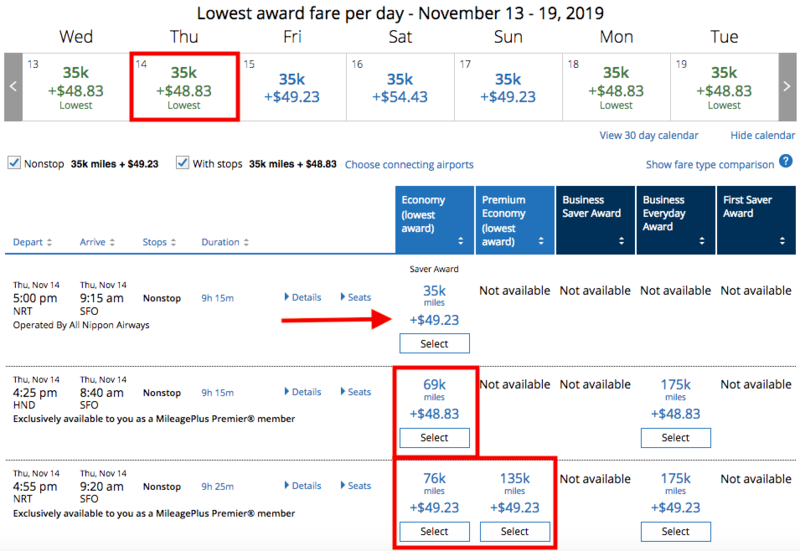 United Mileage Plus just sent out an email that they’ll change to flexible award pricing for all flights on/after November 15, 2019 and no longer adhere to fixed award charts. The changes take effect immediately and apply to the departure date as listed, members are not given any leeway or preparation opportunities for their flight bookings. This is course nothing else but a massive devaluation of the program and considering the frequent mileage sales United has been running in the last few months, it could be seen as somewhat of a scam as well. You can access United Airlines Mileage Plus website with the announcement and FAQ’s here. For travel on or after November 15, we will no longer publish an award chart listing the set amount of miles needed for award flights. Award pricing will now fluctuate based on a variety of factors, including demand. Additionally, starting November 15, we will no longer charge a fee of up to $75 for award flights booked within 21 days of departure. So to get this straight: United changes the prices effective immediately but members still have to pay the close in award booking fee (which most elite members have waived/reduced anyway) until November 15th – how convenient for them! Award prices will now fluctuate based on a variety of factors. Some air awards will be available for less than what’s listed in our chart, which you may have already noticed. After November 15, award prices may also be higher, especially if you’re traveling at popular times. Use our flexible award calendar to get a monthly view of the award prices for a specific destination. Increasing award prices for the most in-demand flights allows us to offer lower prices on other flights. If your award travel is flexible, these updates will help you make the most of your miles. If you need to change your award ticket, you will be issued a new ticket for which new pricing and additional fees may apply. United appears to already have gone overboard with their prices and the date limitation of Nov 15th doesn’t even properly apply. 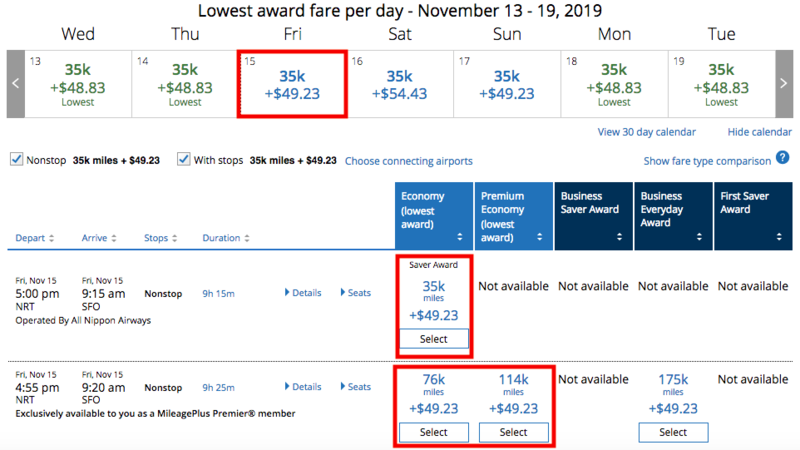 On November 14th there is an ANA flight in Economy at 35k miles and United prices double (or more) 69k/76k for their ECONOMY and 135k for Premium Economy Class – CRAZY! The FAQ is missing some substantial information including if these changes apply to United flights only (as the pricing here suggests) or if Star Alliance flights are impacted as well. When looking at the example above one can’t help but wonder if United is at all sane. Who would book a United flight and spending a 100-120% premium over an ANA flight? Not even talking about the absolute ridiculous pricing of the Premium Economy. 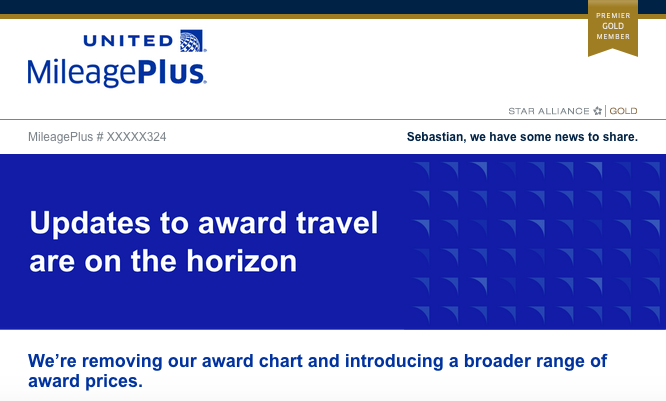 A frequent flyer program that doesn’t operate fixed award charts is an absolute deal breaker for me. Combined with the earning based on fare (for 016 tickets) it’s totally unattractive now for active United flyers. If you’re one who mainly credits Star Alliance flights to Mileage Plus this could still work but we’ll definitely monitor what’s happening to the flexible pricing for star alliance awards.